More certified “Local Organic” food will be available at Farmer’s Markets and organic consumer’s doorstep in Ontario in 2015! Locally grown organic produce bearing the Pro-Cert Local Organic logo means that it was produced on a small farm in Ontario in accordance with the Canadian Organic Standard and certified by Pro-Cert Organic Systems (Pro-Cert), an independent agency. A small farm, as defined by the provider of this unique service, is usually less than 10 ac in size, and is owned and operated by an Ontario family. “The Ontario program is a pilot project designed for provinces without provincial regulations or with regulations which will accommodate risk-based inspection and surveillance intensity” noted Dave Lockman, the Pro-Cert Certification Program manager for Eastern Canada. The oversight and surveillance focus in LOC is on verifying the absence of unpermitted synthetic fertilizers, herbicides, insecticides, fungicides and other pesticides, and the non-use of GMO and other unpermitted technology during the annual food production cycle. Similarly, emphasis will be placed on ensuring the absence of unpermitted sanitation agents and preservatives during any on-farm processing, handling and transport to the market place. Pro-Cert growers with dedicated land area greater than 10 ac are also able to use the Pro-Cert “Local Organic” logo on produce/product sold within the province but must be certified compliant with the Canadian Organic Regime (COR) and the annual inspection requirement. The cost of this new service will be $300 per year based on a risk adjusted inspection schedule, plus inspection travel cost of $50 per event. The frequency of inspection will depend on the level of organic compliance as determined at the most recent inspection event or by other means of surveillance including but not limited to random sampling of produce and testing for unpermitted substances and technology. Small organic farms which require more than one inspection every two years will be required to pay for the extra inspection(s). “Organic integrity is implicit in this risk based program” claims Hamm, who has worked as a forensic agrologist for some 45 years. “Producers who stray from the Canadian national standards will be identified and their problems will be corrected if they wish to use the Pro-Cert ‘Local Organic’ logo” continues Hamm. The future of the LOC program in Ontario and in other provinces will depend on provincial organic regulations. If Ontario and the other provinces make provision for risk assessment based certification of small farms selling produce within their jurisdiction, then the Pro-Cert LOC program and similar programs will carry on into the future. British Columbia is in the process of converting its voluntary risk assessment based provincial organic certification program to a mandatory one. “We are hopeful that Ontario and the other provinces will follow B.C.’s and Pro-Cert’s lead in addressing the special needs of small organic farmers with local markets,” continues Lockman. Quebec, Manitoba and New Brunswick already have provincial regulations governing the use of organic labelling within their boundaries. All of these provinces have simply adapted the COR requirements without special provisions for small farms. “’Local’ is a consumer/producer driven phenomenon that is not going away” mused Hamm. 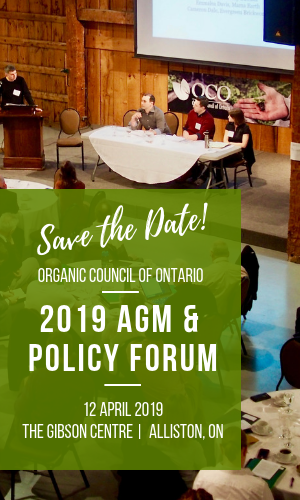 “Organic producers and consumers in Ontario and across Canada will benefit from the Pro-Cert small farm certification program and without a decrease in diligence, organic integrity or confidence” he concluded. Pro-Cert is Canada’s only Canadian, wholly family owned, certifying body. Its Head and Western Regional Offices are located on the Hamm family organic farm near Saskatoon, Saskatchewan. The Eastern Regional Office is located in the Village of Cambray, Ontario, and is responsible for the Ontario LOC program.